Canberra City Band performs at the 2013 Anzac Day ceremony. Photo: Canberra City Band. 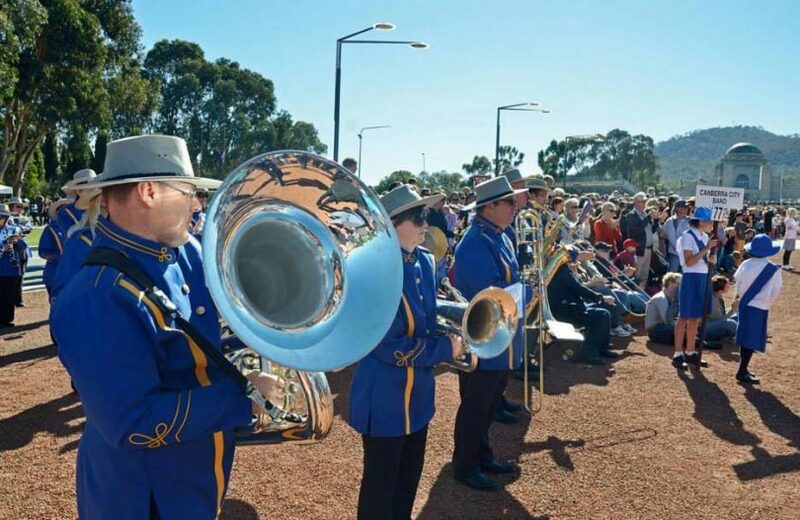 RSL Canberra has rejected pleas from ACT community bands, including a petition from the Canberra City Band, to be reinstated in the coming Anzac Day Parade. The bands were last month axed from the event in favour of a trialing speaker system relaying music from the Royal Military College Band performing at the top of Anzac Parade down the length of the march. RSL Canberra President John King said the Australian War Memorial was paying for the trial and although he did not know how much it would cost, companies had previously quoted about $5000. The AWM had directed all previous questions back to the RSL. He said the trial had been funded and was set in place, and claimed bands he had spoken with were comfortable with the decision. Mr King told bands in a letter last month that the veteran’s organisation had requested the AWM trial a new audio system designed to resolve issues with the march music. “You will appreciate that for many years there have been issues with the march music, including inconsistent tempos and audibility, that have been a concern to our marching veterans,” Mr King wrote. Canberra City Band, which has performed at every Anzac Day service in the ACT, launched the change.org petition, saying that removing live music from the parade will severely diminish the spirit of the day. It says the band and other community bands have not been consulted about the decision, and the RMC band will not be able to play continuously for the entire event, something Mr King denied. The petition has garnered nearly 600 signatures. Canberra City Band says there are a variety of alternative compromises which will address these concerns. “We passionately seek to reach a compromise that will achieve ALL of our mutual goals to honour and serve,” it says. The band also says that the ‘look’ of hundreds of passionate musicians along the parade route contributes greatly towards honouring the troops. “To replace those people with speakers and cables will remove the human qualities from the event, and make it feel cold and impersonal,” it says. But Mr King said complaints from veterans about the bands had been a regular feature of Anzac day de-briefing and eventually something had to be done to get the march beat up to the same speed. “On Anzac Day if they [the bands] want to entertain, they’ve got to play the right music at the right tempo because first and foremost the bands are providing the tempo for the marchers,” he said. Mr King said the RSL pointed out to the AWM that its own people had the ability to pipe the music down Anzac Parade and suggested it was time to trial the system. He said if the trial fails, then the bands would be invited back to the parade. The Canberra City Band turns 93 years old in 2018. “Please help us retain this tradition which is so important to our members and our community,” it says. What are your thoughts on this issue? Let us know by commenting below. I love the bands, especially the pipe bands. The march just won't be the same without them.. Interesting that most people protesting here (and on the other thread) have no actual idea what they are actually protesting about! I think it is time to cancel the March in Canberra as not many veterans left. Let's just focus on the dawn service. Obviously we went to different marches last year. It was pouring rain and cold and yet, for all that, I recall thousands of veterans marching. The pressure for this is almost certainly from the LNP old boys at the War Memorial on the RSL. Sick. Marching bands and community bands have a long and important tradition in all communities. Community bands have a special and fresh sound. Can't stand artificial noise. Community bands are important - let them march! I think it is sad to exclude them. You’ll be delighted to hear that this has already been looked into, and most of the places like Braidwood already have community bands involved.